I had the pleasure of meeting Roman Roth in Long Island during Taste Camp in May, while he led us through a fabulous tasting at Wolffer Estate. 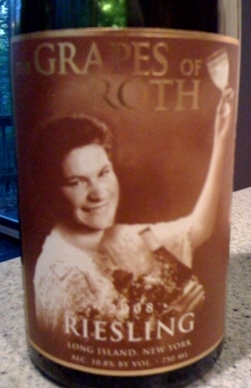 While Roman is the head winemaker for Wolffer, he also makes wines under his own label “Grapes of Roth”. I had the opportunity to taste his Grapes of Roth Merlot and absolutely loved it and Roman was nice enough to grab me a bottle of the sold out 2002 from his secret stash. In addition to Merlot, Roman has been bottling a Riesling since 2007 under his label. A couple of weeks ago I received a nice email from Roman asking if I would like to try the 2008 Riesling ($22) and of course I jumped at the opportunity. One, because I love Riesling and two, because I enjoyed his Merlot so much. I drank this with some vegetarian tacos and it paired very well. Overall both Megan and I were impressed by the wine and Roman’s German heritage is evident in the wine. If I had one complaint about the wine it would be that I didn’t get any of the classic petrol notes that I really enjoy in my Riesling. Other than that, the touch of sweetness helped make the fruit more vibrant and rich but was balanced by the racy acidity that ran across the palate. I plan on grabbing a couple more bottles when I head up to Long Island in October. Over the past couple of years I have really come to enjoy Riesling, slightly sweet and rich, bone dry and mineral driven and somewhere in between, Rieslings are a truly fabulous wine. I have had a couple of Rieslings in the past two weeks that are on pretty opposite ends of the spectrum, although not as far apart as the could be. One, is the 2003 Pewsey Vale “The Contours” and the other was the 2007 S.A. Prum Blue Slate Kabinett. The first from the Eden Valley in Australia and second from the Mosel in Germany, far away in latitude as well as taste. Both from great vintages of their respective regions, both of these wines are still young but are drinking great now. The first is bone dry and can be summed up as drinking a limeade out of a stone cup. The second, a classic German Riesling complete with rich fruitiness, just the right amount of sweetness and petrol to round out the aromatic and flavor profile. The S.A. Prum is pretty widely available but the Pewsey Vale is harder to find, grab either one if you are in the mood for a good Rielsing. I love Riesling and wish I drank more of it, not sure why I don’t. 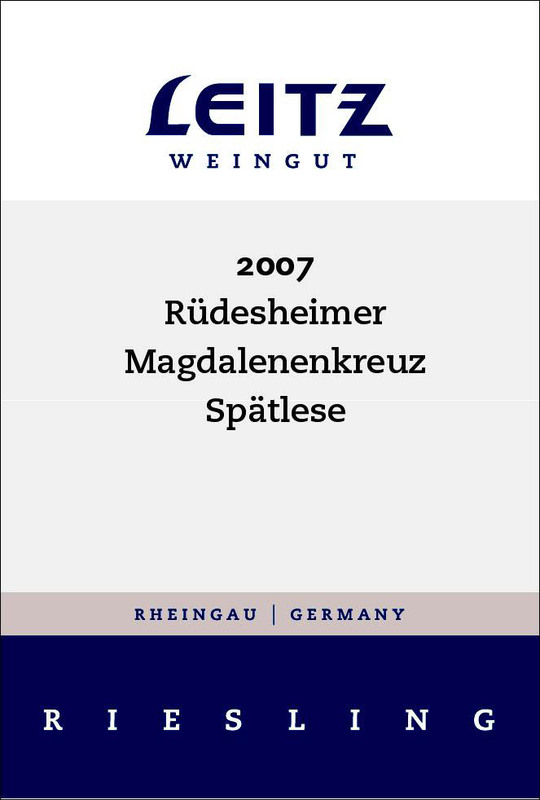 I tasted this at a trade tasting in New York with hundreds of other Rieslings and the 2008 Leitz Rüdesheim Magdalenekreuz Riesling Spatlese had one of the best QPR’s of the bunch. Great quality Spatlese (actually Auslese but labeled Spatlese), full and rich with nice touches of petrol and stony minerality dancing around great fruit and honey flavors. This has pretty good distribution so you should be able to find it in most cities. This was a very well put together Riesling but on it’s own it might have been a bit to sweet for me, but paired with spicy Pad Thai that we made it was excellent. The heat helped the sweetness fade and showcased the rest of the flavor profile that the wine had to offer. The wine for this Wine Blogging Wednesday #45 is the second wine in my WBW blogger pack from Domaine547. This months WBW topic was supplied by Tim at Winecast and was any Riesling from the “Old World.” The blogger pack Riesling was the 2006 Max Ferd Richter “Graf Zeppelin” from Mosel – Saar – Ruwer. From the winery website, the history of the title of this wine, “Graf Zeppelin” is that is was the wine poured most on Zeppelin flights during the 20’s and 30’s. The grapes from this wine are grown in the Mülheimer Sonnenlay vineyard which consists of soil composed of gray slate soil resting on steep slopes along the Mosel river. We ate this today (WBW) with General Tso’s “Chik’n” and it paired nicely being slightly off-dry counteracting the spiciness of the dish. This was a fun textbook Riesling that was a great pairing for the Chinese food. Classic food friendly flavors, a hint of sweetness and great viscosity on the palate would make this great for any spicy dish. Thanks again to Tim for a great May WBW topic. Germany met India on my palate with the 2005 Bert Simon Serrig Herrenberg Riesling Kabinett. We had this wine with one of our Indian dishes, Dopiaza. Although we put more veggies in it than you would find in the traditional dish, the sauce still tastes the same. The wine was an excellent pairing for the slight heat of the food, with the floral nose and the hint of citrus and honey on the palate to really accentuate the south Indian flavors in the food. The clean mineral finish really left the mouth ready for the next bite of naan and tofu, drenched in Dopiaza sauce. This is an excellent buy at $18, although I understand that the 2005 is the last vintage that Bert Simon will be making wine. If anyone can verify this for me, please let me know.